Northwest Chess is a non-profit corporation registered in Washington State. Business Manager Address: Eric Holcomb, 1900 NE 3rd St STE 106 PMB 361, Bend, OR 97701-3889. See magazine section for subscription and advertising information. Are you ready to subscribe to Northwest Chess and join your state chess federation (for residents of Washington)? - See: PayPal Subscription/Membership Form | Printable Form (PDF file). Residents of other states may subscribe without a state membership. 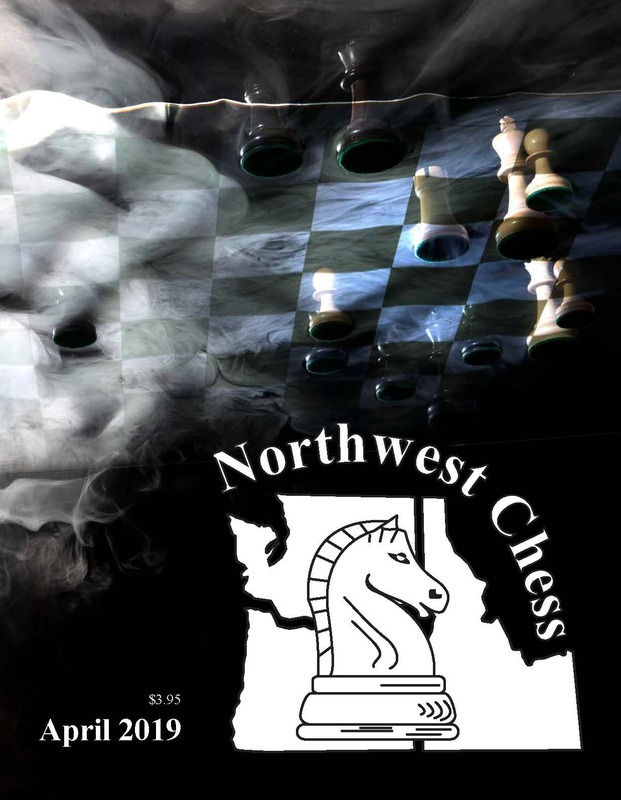 Northwest Chess Facebook page | NWC Facebook "app" page for mobile device screen. Online Registration – Available for some upcoming WCF and scholastic events. Search the NWC website using Google™ custom search (this opens a new page). 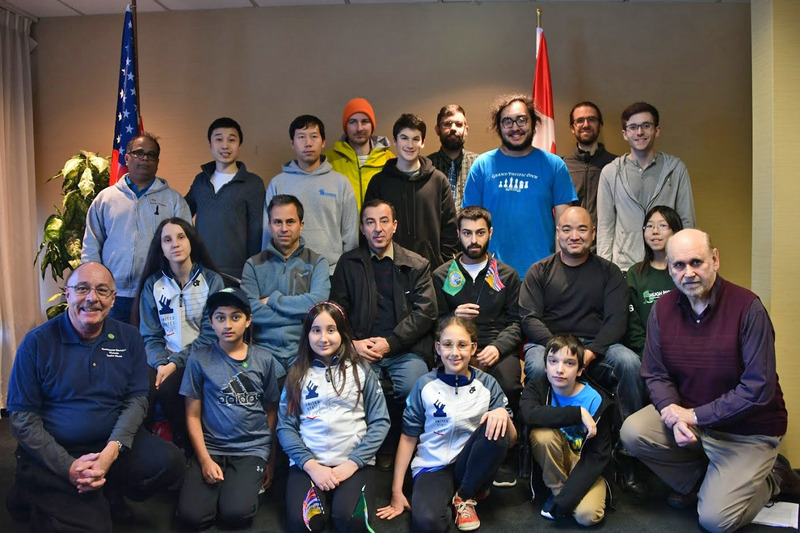 Northwest Chess blog - See reports on local chess events and occasional comments and discussion from NWC officers and editors. Northwest Chess logo store on CafePress - order shirts, coffee mugs and other merchandise. Now 439 issues! Northwest Chess magazine back issues - For a complete list of available issues (scanned prior to Sept. 2008, made from the print production files thereafter), please see the Northwest Chess Scanning Project page. Washington Chess Letter scans from the 1947-1964 time period are also available and included. As of Nov. 2017, our games viewer has been updated to the Chessbase viewer, which has many modern features. You can view games from the Washington and Oregon state championships and some other regional chess tournaments directly in your browser. See the games page. Northwest Chess receives a portion of each sale made using this link. Note: See calendar and TA pages for more info about upcoming chess events. For ICA (Idaho) membership options, please visit the ICA website. These options include a "premium" membership with a NWC subscription. For OCF (Oregon) membership options, please visit the OCF website. The NWC board has approved a non-member NWC annual subscription promotional rate of $25 until June 30. PayPal Subscription Form. For new subscriptions and renewals on or after April 1, NWC no longer guarantees that there will continue to be 12 printed magazines each year, beginning in 2020. There could be fewer editions, and/or publication could be in an online format. The NWC board has a committee to study this topic. In 2018, the NWC board decided to add "Foundation" to its corporate name, becoming the Northwest Chess Foundation. We will completely update the website once this name is officially registered with the State of Washington and the IRS. This does not affect the name of the magazine - it's still Northwest Chess! The Northwest Chess Forum (bulletin board for chess-related discussions) has fallen into disuse, and has been disabled. By end of April - Other (non-GP) events! See "How to get to the GPO in 2019" by H.G. Pitre. Nakamura wins U.S. Chess Championship! The annual U.S. Chess Championship (and also the Women's Championship) were held March 18 to April 1 in St. Louis. See the website and also the final John Henderson blog post, and congratulations to Hikaru Nakamura for winning the championship with a final-round victory. J. Yu is the winner of the U.S. Women’s Championship, with a very impressive score of 10 out of 11 possible points. Immediate short-term foreign exchange student opportunity - see scholastic opportunities page. Fundraiser! The Seattle Sluggers and Pacific Northwest Chess Center are teaming up to run a joint fundraiser! This is in an effort to help offset the costs of running the Sluggers' GMs each week in the PRO Chess League and to support the development of the PNWCC, which provides a first-class chess playing experience in the Northwest. All funds raised will be evenly split between the Seattle Sluggers and the PNWCC. For info or to donate: https://www.pnwchesscenter.org/donation-and-volunteers. PNWCC is a 501(c)3 non-profit corporation. May magazine! The May issue of Northwest Chess is in production, and should be mailed by about 4/24. It's a 32-page issue with with "For The Record" by the Northwest Chess Staff, "Another Name On The Trophy" by Jason Cigan, "Washington President’s Cup" by Travis Olson, "The Game That Matters" by Jeffrey Roland, "Boise Chess Club (Poem)" by Glen O’Harra, "From The Business Manager" by Eric Holcomb, and a back-cover cartoon of "Odie and Morgan playing chess" by Brian Berger. Cover: Jason Cigan by Andrei Botez. See the teaser (selected pages with color). April magazine! The April issue of Northwest Chess was mailed on 3/27. It's a 32-page issue with "2019 Idaho Closed" by Jeffrey Roland, "2019 Idaho Closed" by Barry Eacker, "ICA Tip Of The Month" by Adam Porth, "2019 Idaho Scholastic Championship" by Alise Pemsler, "February 2019 PCC Game/60" by Brian Berger, "Dave Collyer Memorial" by Kevin Korsmo, "Photo collage of the John Donaldson Simul" by Adam Porth, "2019 Washington State Team And High School League" by Randy Walther, "2019 Washington State Championship" by Josh Sinanan, and a back-cover photo of "Waiting For Clarity" by Philip Peterson. Cover: A View From Below by Philip Peterson. See the teaser (selected pages with color). GP Final Results! 2018 John A. Braley Memorial Grand Prix final standings and results are available from links on the GP page. Checks were mailed to the Washington and Oregon winners by Saturday 2/23 (Idaho is on hold), or some winners received NWC subscriptions if not currently members of their state chess organization. Congratulations if you're one of the winners! Exhibit Honors US Chess! A new chess history exhibition, "US Chess: 80 Years - Promoting the Royal Game in America," will open at the World Chess Hall of Fame (WCHOF) on March 6, and will be on display through October 27. The exhibit celebrates the US Chess Federation (US Chess), the official governing body of American chess, and its many accomplishments since its 1939 founding. See the WCHOF website for more info. March magazine! The March issue of Northwest Chess was mailed on 2/27. It's a 32-page issue with "Eternal Cube (a poem written at the 2019 Idaho Closed)" by David Zaklan, "2019 Idaho Blitz Championship" by Jeffrey Roland, "ICA Tip Of The Month" by Adam Porth, "PCC January 2019 Game 60" by Brian Berger, "West Regional Scholastic Tournament" by Jeffrey Roland, "Letter To The Editor" by John Frostad, "Introducing Pacific Northwest Chess Center" by Xuhao He, "PNWCC Through A Player’s Eyes" by Coliln Smith, "PNWCC’s First Master" by Lisa & Charles Levine, "Team BC Edges Out Team Washington" by Paul Leblanc, and a back-cover photo of "2019 Idaho Blitz Champion James Wei" by Jeffrey Roland. 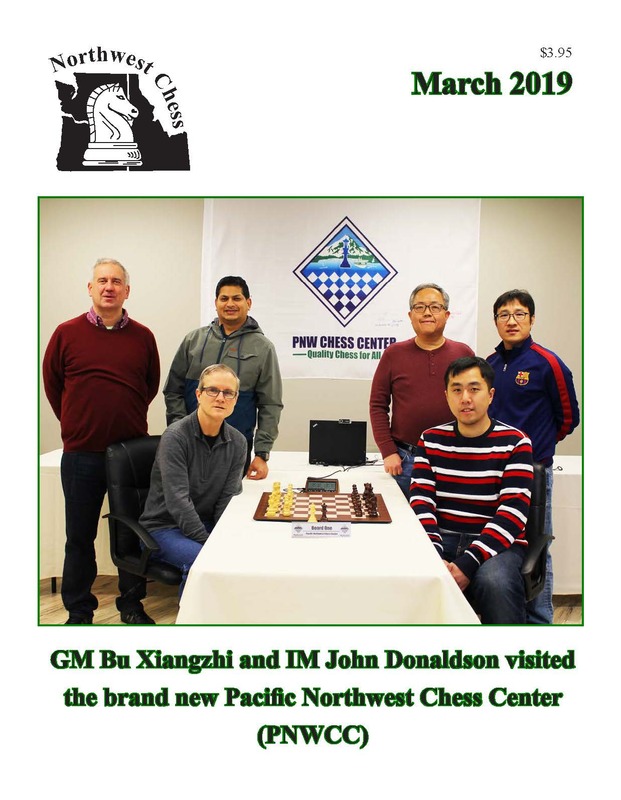 Cover: GM Bu Xiangzhi and IM John Donaldson visit PNWCC. See the teaser (selected pages with color). Sluggers Season Over! - Jan. 8th was the Sluggers first match of the new season, against the San Diego Surfers, and as reported by Josh Sinanan, "The Sluggers scored an amazing 9-7 victory in the opening match against the San Diego Surfers, former Pacific Division champions!" Other results: (1/15) lost 6.5-9.5 against a very strong Dallas Destiny team; (1/22) won a brilliant match by a score of 9.5-6.5, against long-time archrival, the San Francisco Mechanics; (1/29) finished in 4th place (of 8 teams) in the first "Battle Royale" of the season; (2/6) an 8-8 tie on against the San Jose Hackers; (2/12) a tough loss by a 10-6 score against the Australia Kangaroos; (2/19) finished in 4th place in the second "Battle Royale" of the season; (2/27) lost a tough match 5.5-10.5 against the Minnesota Blizzard; (3/7) lost a tough match 5-11 against the division-leading Chendu Pandas; (3/12) ended the season by finishing in 7th place in the final Battle Royale. So after the final match of the season, the Sluggers finished with 2 wins, 1 draw, and 4 losses, unfortunately just missing the cut to stay in the league for next season. Matches had a time control of 15-minutes with a 2-second increment (4 games), and took place on chess.com. The Seattle Sluggers competed in the Pacific Division of the PRO Chess League. February magazine! 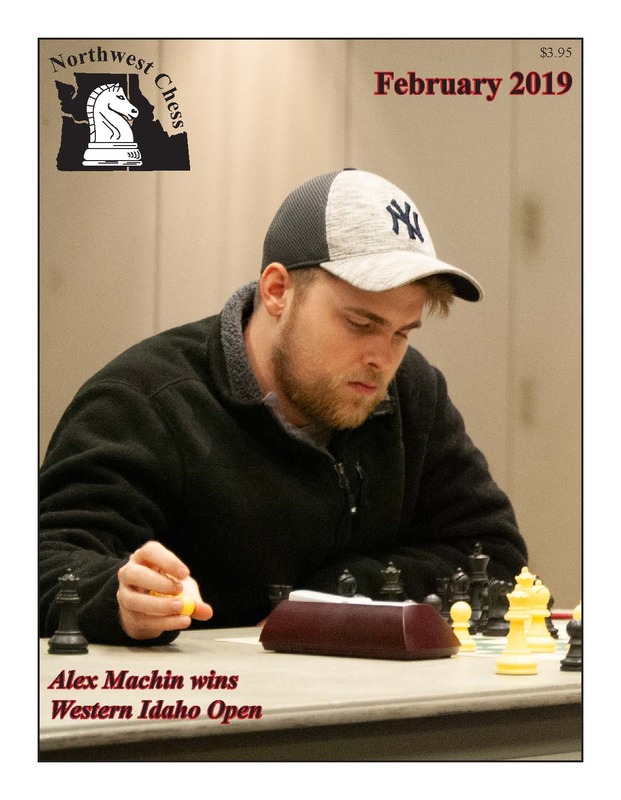 The February issue of Northwest Chess was mailed on 1/29. 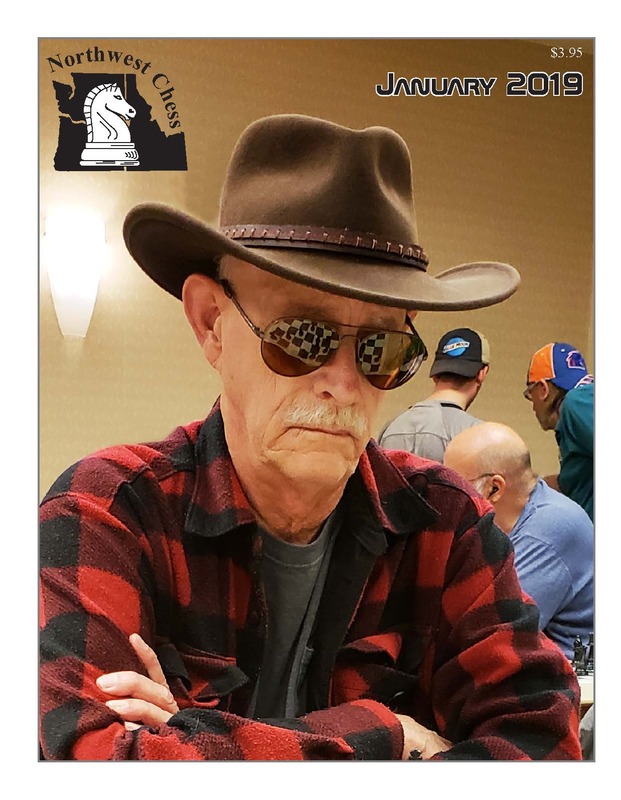 It's a 32-page issue with "PCC December 2018 Game 60" and "Neil Dale Memorial" by Brian Berger, "2018 Western Idaho Open" by Jeffrey Roland, "Le Parc d’Echecs" by Carmen Pemsler, "Winter Solstice In The North" by Adam Porth, "Successful Year For Central Oregon Chess" by Eric Holcomb, "Washington Winter Classic" by Josh Sinanan, "Northwest Chess Open" by Duane Polich, "A Hidden Story That Went Unnoticed (Full-Page Ad)" by Sridhar Seshadri, "Eclipse Photo" by Philip Peterson, and a back-cover photo of "Andrew Kitterman at 2018 Western Idaho Open" by Alex Machin. Cover: Alex Machin at 2018 Western Idaho Open by Jeffrey Roland. See the full edition (all pages with color). January magazine! The January issue of Northwest Chess was mailed on Christmas Eve, 12/24! It's a 32-page issue with "From The Publisher’s Desk" by Duane Polich, "Jason Marr On Chess And Life" by Amanda Warren, "2018 Oregon Class Championship" and "PCC November 2018 Game 60" by Brian Berger, "2018 November Third Weekend" by Jameson Tang, "2018 Southern Idaho Open" by Barry Eacker, "2018 Northern Idaho Open" by Adam Porth, "Western States Open Success" by Joshua Grabinsky, "2018 Washington Class Championships" by Josh Sinanan, "Washington Class Blitz Event" and "A Thanksgiving Scholastic To Be Thankful For" by Jacob Mayer, "North American Youth Chess Championships" by Mei Xu and Chen Zhou, "Grandmaster Submission!" by James Tarjan, "The Isle Of Mayer" by Jacob Mayer, and a back-cover photo of Drew Machin and Alex Machin by Jeffrey Roland. Cover: John Glenn at the 2018 Southern Idaho Open by Adam Porth. See the full edition (all pages with color). See old news previously appearing on this page. Some local tournament reports are posted to the Northwest Chess (NWC) blog, found at http://www.nwchess.com/blog/. Links are to NWC blog post or other report, usually US Chess or scholastic rating report. Thanks to Rusty Miller for writing most of the tournament reports from 2013 until April 2014. Rusty stepped down, but started blogging again occasionally as of Nov. 2014. If you are interesting in blogging for your club's events, please let us know. Click on photos to enlarge, or see photos in some of the blog posts. Congratulations to Washington State chess co-champions, FM Roland Feng, FM Anthony He and IM Michael Lee! US Chess crosstables. For photos, please see WCF facebook page. Congratulations to Idaho chess co-champions Kevin Xu and Jacob Nathan! 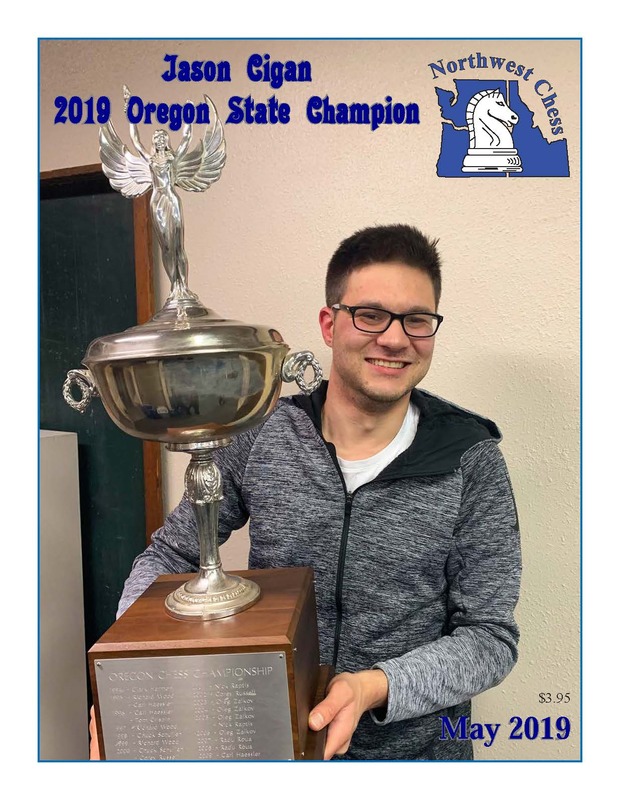 Congratulations to Oregon chess champion Jason Cigan! US Chess crosstables. For photos, please see Portland Chess Club Facebook page. See old tournament news previously appearing on this page. See NWC Bylaws as adopted and signed in 2018. See NWCF Bylaws as adopted Nov. 18, 2018. Response forms — send your inquiry, letter to the editor, business manager, etc. Web site updated 4/17/2019 by J. Eric Holcomb.